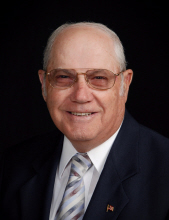 Roy Dean Prater, 83, of Cowden, Illinois passed away at 4:15 a.m. at home on Saturday, January 26, 2019 surrounded by his loving family. Roy was born May 24, 1935, in Cowden, the son of Gordon and Ina (Lockart) Prater. He was a graduate of Cowden High School in the Class of 1953. He and Joan Dennistoun were united in marriage on January 27, 1957 and enjoyed 61 wonderful years together. Roy was a veteran of the United States Army having served in Okinawa, Japan. He was member of the First Christian Church of Cowden where he served as a deacon and finance chairman. He was a past board member of the Fayette County Farm Bureau, Production Credit Services and Cowden School Board. Roy enjoyed tinkering around on his backhoe and having coffee with his friends. Surviving are his loving wife, Joan of Cowden; children: Deb (Gary) Huddlestun of Casey, Bob (Vanessa) Prater of Herrick, Kim (Rick) Crouch of Cowden and Jim (Amanda) Prater of Mattoon; 11 grandchildren and 11 great-grandchildren. Preceding him in death were his parents, Gordon and Ina Prater; brothers: Everett, Charles and Dale Prater; sister and brother-in-law, Miriam and John Toothman. Funeral services will be held at 10:00 a.m. on Saturday, February 2, 2019 at the First Christian Church in Cowden with Pastor Nate Harper officiating. Burial will take place in Mound Cemetery. Visitation will be from 4:00-8:00 p.m. on Friday, February 1, 2019 at the First Christian Church in Cowden. Memorials may be made in Roy’s name to the First Christian Church, 404 E. Locust Street, Cowden, IL or the Juvenile Diabetes Research Foundation (JDRF). Lockart-Green Funeral Home in Cowden is assisting the family. Family and friends are invited to light a candle or share a story in Roy’s honor at www.lockartgreenfuneralhome.com. To send flowers or a remembrance gift to the family of Roy Dean Prater, please visit our Tribute Store. "Email Address" would like to share the life celebration of Roy Dean Prater. Click on the "link" to go to share a favorite memory or leave a condolence message for the family.